Around one in five people in Western countries could be putting their health at risk simply by going to work. This is because working shifts outside of the rest of the population’s normal hours has been linked to obesity, diabetes, heart disease, cancer and even declines in brain function. Scientists think this is because our bodies are programmed to run on cycles known as circadian rhythms, and changes in our routine caused by shift work or travelling long distances disrupts those rhythms. But our new research suggests that the effects of shift work or jet lag on our body clocks could be reduced simply by changing the times at which people eat. The key to this theory is the idea that each person doesn’t just have a single body clock but rather a complex network of billions of cellular clocks found throughout the body. In humans and other mammals, there is a master clock within a region of the brain called the suprachiasmatic nuclei (SCN) and many peripheral clocks found elsewhere. In most individuals, the master SCN clock is set to the planet’s natural cycle of light and dark. The SCN clock then synchronises the peripheral clocks by controlling the rhythms of nerve activity, hormone secretion, body temperature and behaviour such as sleep-wake cycles. By synchronising the peripheral clocks, the SCN maintains the harmony of the entire body’s rhythms. Significant changes in our daily routines, for example when we fly into another time zone or work overnight shifts, can desynchronise these rhythms. In the short term, this can disrupt our sleeping and eating patterns and make us feel tired and unwell (jet lag). 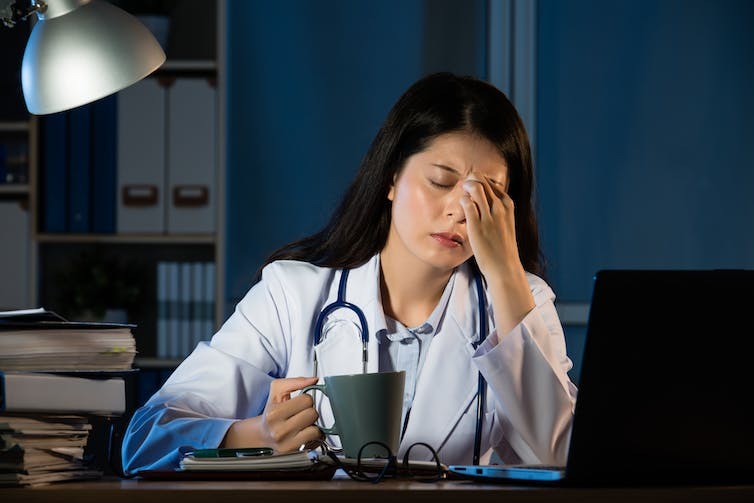 Over a longer period, scientists think it can contribute to the health problems associated with shift work. People flying long distances often try to minimise jet lag by adjusting their routines to their new time zones as soon as possible. For our research, we wanted to see how one aspect of this approach – changing meal times – affected circadian rhythms. We found that delaying meals by a certain amount caused a similar shift in some peripheral clocks, without changing the master clock. This is important because research in animals suggests peripheral clocks take longer to adjust to a new routine. We’ve known for a long time that eating at different times affects your metabolism differently. The body has a natural circadian rhythm for blood sugar concentration, meaning that if you ate consistent small snacks instead of occasional standard meals, your blood sugar would still change over the course of the day. Similarly, eating an evening meal results in a higher peak of blood sugar and fat concentration than eating in the morning. Research has also shown that eating can affect some rhythms in animals. Several decades ago, researchers found that if they gave animals food for just a few hours at the same time every day, the animals’ bodies would start anticipating the daily feed through changes to things such as body temperature in the two or three hours beforehand. They still displayed these rhythms even after the food was later completely withdrawn for a couple of days. This lead to the notion of a “food-entrainable oscillator” clock somewhere in the body that is distinct from the SCN clock and related to meal times. More recent animal studies indicate that many peripheral clocks outside the brain can be synchronised by restricting food to a few hours every day. So the food-entrainable oscillator may actually comprise several clocks within the body. But the complex nature of the peripheral clocks makes them difficult to study, so our understanding of exactly how meal times synchronise human biological rhythms has been poor. At the end of each period, we measured their biological rhythms under “constant routine” conditions so that their body clocks were allowed to tick without being affected by external factors, such as the daily light and dark cycle. In order to remove acute responses to meals, each subject received an identical snack every hour during the constant routine parts of the study. The most striking results from our study were that the five-hour delay in meal timing caused an approximately five-hour delay in the rhythms of blood glucose. Markers of the master SCN clock didn’t change, but the way a certain clock gene released its instructions to the body in white fat tissue was delayed after the late meals. So we think that changing the meal times reset some peripheral clocks without affecting the master clock. Existing advice for jet lag and shift work often hinges around controlling light exposure to help adjust the master clock. Our findings imply that changing meal times as well as light exposure may help your master and peripheral clocks shift at the same speed. This would reduce desynchronisation of the body’s clocks and so could reduce health problems. We can’t say for sure what happens to human clocks in jet lag and shift work, as it’s almost impossible to do the necessary experiments. And we don’t yet know whether altering meal times would counter the health problems linked to shift work. But it’s certainly possible it could reduce the stress that such unnatural routines place on the body.